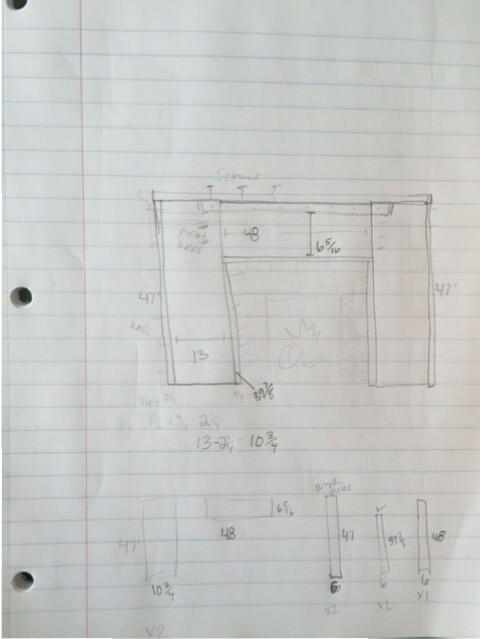 Then I drew out a careful plan with lots of math and measurements of the basic mantel piece. I had to build the form with the raw MDF sides facing out (rather than to the sides) because I knew they would be covered up by trim. Turned out all the corners and sides got covered up so that was moot but at least it allowed me the freedom to make that decision. I also had to subtract inches from the sides to account for the space the trim would take up. I decided to build the top center piece as high as the boards under the old mantel so I could use that as an anchor to attach the entire mantel to the wall. I don’t know why but the people who built the fireplace wall didn’t have any studs on either side of the tiled portion for me to attach my mantel to.